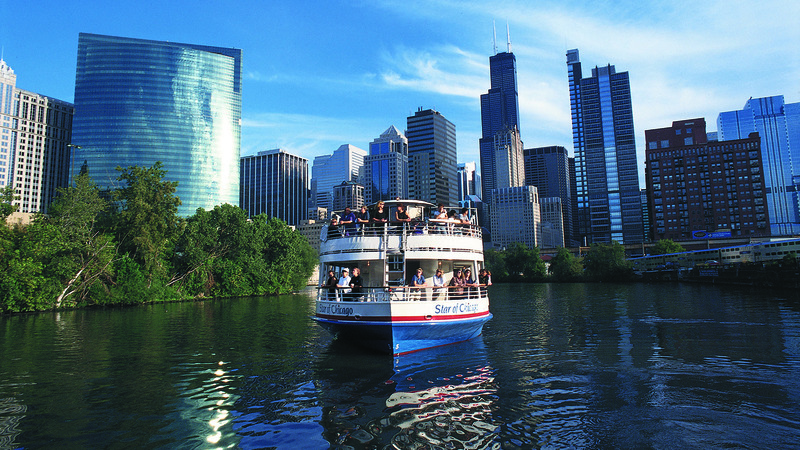 Hot weather and sunny skies are enticing Chicagoans onto the water. More cruises and kayaks have joined commercial barges on the river in recent years, and that new traffic has some tour boat operators concerned about safety. On June 29, the Chicago Harbor Safety Committee premiered an educational video detailing best practices for boaters on the Chicago River and Lake Michigan. Those planning a trip on the river can find information about “rules of the road” and learn to interpret the traffic signals used by commercial boats. The film discusses entry, docking and amenities at several harbors along the lakefront, as well as geographical hazards like breakwaters. The Chicago Harbor Safety Committee is a partnership between recreational boaters, commercial operations and government agencies. The group formed in 2013 at the recommendation of the Coast Guard, in the wake of a harbor safety study by that organization. Gary Feracota, a member of the CHSC, many in the marine community also anticipated a traffic boom on the river due to the Riverwalk’s revamp. Feracota, who is also a co-founder of Pinnacle Yachts, says the varied types of boats on the river can make it tricky to navigate. “The issue of small boats—canoes, kayaks and small electric boats that are being operated by people who aren’t particularly skilled on their own—along with giant commercial vessels that are moving materials on a schedule, can cause quite a lot of conflict,” he said. Whether a boater sets out on the river or the lake, boaters should check the weather first. “Weather comes up very quickly from the west here in Chicago and is sometimes camouflaged by the tall buildings,” Feracota said. He also advises boaters to use a marine radio, inform those on board of possible hazards, check the vessel for any structural or mechanical problems, and make sure there’s enough fuel. The CHSC stresses that drivers shouldn’t drink alcohol and everyone on board should wear a life vest, or have them ready to use. Feracota and Larry Dostal of the Chicago Harbor Safety Committee join Phil Ponce in discussion Thursday. Watch CHSC’s educational film below. May 26: Officials in Whiting, Indiana, think their city is about to become a whole lot more popular. Feb. 22: In the depths of a Chicago winter – and especially when there's a winter heat wave – sometimes you just have to get outside. But what if you’re not one for skiing or skating? We decided to go fish. Aug. 6, 2015: Chicago is embracing its river like never before. But what about that other hard working river, the Calumet, on the Southeast Side? Jay Shefsky explores the area with a couple of local kayakers.